The Austin Taylor Papers, 1916, are now processed and ready for researchers. 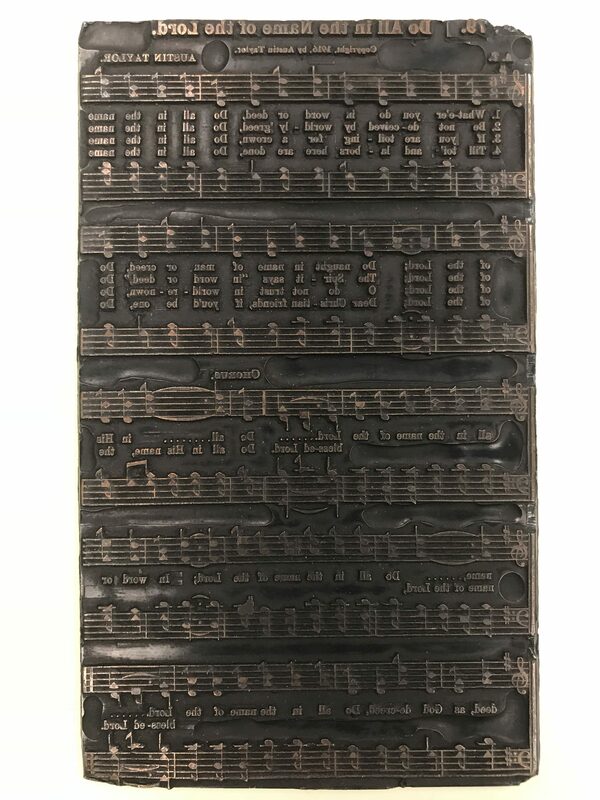 The Taylor papers contain one hymnal printing plate for the song “Do All In the Name of the Lord.” The finding aid for this collection is available here on DigitalCommons@ACU. Archives, Brown Library. Abilene Christian University, Abilene, TX. “Austin Taylor.” Paperless Hymnal. (accessed December 13, 2018). “Do All in the Name of the Lord.” Hymnary.org. (accessed December 13, 2018). Hamrick, David W. “Do All In the Name of the Lord.” David’s Hymn Blog. (accessed December 13, 2018). Taylor, Austin; Showalter, G. H. P.; Slater, W. W.; Ragle, D. M.; Veteto, A. J.; Morgan, R. M.; Burt, T. P.; Cox, Silas L.; Foster, A. T.; and Park, L. G., “Song Crown: A New Compilation of Sweet Gospel Songs” (1912). Stone-Campbell Books.